T17 Square Dr Washer Head Screw. Compatible with most Pocket Hole Jigs Including Kreg and General. The washer head of this screw will not overdrive in the bottom of the pocket. This is especially important in softer material. 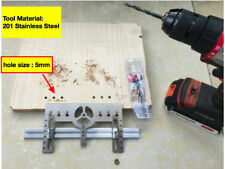 Making hole drilling for your cabinet door or drawer pull handle hole drilling faster. Self aligning L-shaped mounting foot for easy installation. The steel pin on this clamp is shaped to fit snugly into a pocket hole, securely anchoring one workpiece against the other for easy assembly. Automaxx technology adjusts automatically to material thickness. All Kreg screws feature a deep #2 square drive, a needle-point self tapping tip, and a case hardened design built for strength. Kreg Pocket-Hole Screws Increase The Strength Of A Pocket-Hole Joint. This kit contains five of our most popular self-tapping screw sizes for Pocket-Screw Joinery, in a durable easy-to-carry case. The perfect screw organizer! A compact, convenient case for Kreg screws and more. Molded recesses hold up to 14 new Kreg screw containers. Also holds Kreg hardware containers (small and large). Coordinates with the system organizer to create a stackable organizing system. Washer head prevents overdriving in pocket bottoms. Oak Micro Pocket Wood Plugs. Works with Micro Pocket Pocket-Holes. Plugs require minimal sanding to match pocket angles. Use these Kreg pocket-hole screws to complete a variety of wood joinery tasks. It includes 5 types of common fasteners used to join pieces of wood 1/2 in. to 1-1/2 in. Fastener Plating: Zinc. Fastener Type: Self-Drilling Screw. Versatile pine plugs for pockets. 50-count bag. Versatile maple plugs for pockets. Designed for visible pockets. Plugs require minimal sanding to match pocket angles. Made from accurate dowel for minimal sanding. All Kreg screws feature a deep No. 2 square drive. Kreg SK03 Pocket-Hole Screw Kit in 5 Sizes. Includes self-tapping screw sizes for pocket-screw joinery. Contains 675 of 5 most used screws. Includes a durable easy-to-carry case. Use these Kreg pocket-hole screws to complete a variety of wood joinery tasks. It includes five types of common fasteners used to join pieces of wood 1/2 in. 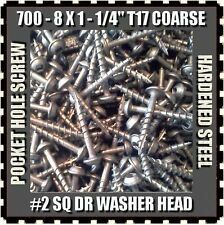 Pocket Hole Screw Kit Zinc Silver Steel 675 Count Portable Storage Case New. Kreg SK03 Pocket-Hole Screw Kit in 5 Sizes. All Kreg screws feature a deep 2 square drive, a needle-point self tapping tip, and a case hardened design built for strength. All Kreg screws feature a deep No. 2 square drive. Accepts the head of a standard 1/4" bolt. 4' Section. Self aligning L-shaped mounting foot for easy installation. We will respond within 24 hours and will work with you to resolve any problem you may have. Pocket Hole Screw Kit Internal Square Coarse Square Steel Silver Round Outdoor Use these Kreg pocket-hole screws to complete a variety of wood joinery tasks. It includes five types of common fasteners used to join pieces of wood 1/2 in. to 1-1/2 in. thick after drilling holes with a separately sold jig. A handy storage case with individually labeled compartments for each fastener type is included along with instructions for the proper application and wood thickness. ---150 count of: SPS-F1 (1 in. ), SPS-C1 (1 in. ), SML-F125 (1-1/4 in.) and SML-C125 (1-1/4 in.) ---75 count of: SML-C250B (2-1/2 in.) ---Join wood from 1/2 in. to 1-1/2 in. Easily sizeable to length with a hack saw. 3/8" tall x 3/4" wide. If you are looking to add shelf pin holes to an existing piece of furniture or building shelves from scratch, the Shelf Pin Jig is the perfect tool for the job. There is drill bit storage built in to back of the jig. The Cabinet Hardware Jig takes the guesswork out of installing cabinet knobs and pulls. Perfect for new construction and for refreshing entire rooms. The Cabinet Hardware Jig provides a simple solution for the intimidating task of drilling mounting holes for cabinet knobs and pulls. Kreg screws are constructed of highly durable case hardened steel for the strongest possible joint. The unique design of the self-tapping tip acts as a pilot to drill its own hole in the mating workpiece to prevent your material from splitting. 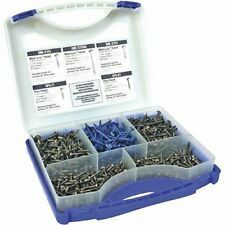 Kreg SK03 Pocket-Hole Screw Kit in 5 Sizes. Item model number: SK03. Included Components: Kreg SK03 Pocket-Hole Screw Kit in 5 Sizes. All Kreg screws feature a deep 2 square drive, a needle-point self tapping tip, and a case hardened design built for strength. Part Number: KMS7509. Item model number: KMS7509. Easily sizeable to length with a hack saw. Date First Available: August 1, 2008. Material: Iron. Includes self-tapping screw sizes for pocket-screw joinery. This kit contains five of our most popular self-tapping screw sizes for Pocket-Screw Joinery, in a durable easy-to-carry case. All Kreg screws feature a deep #2 square drive, a needle-point self tapping tip, and a case hardened design built for strength. Use these Kreg pocket-hole screws to complete a variety of wood joinery tasks. It includes five types of common fasteners used to join pieces of wood 1/2 in. to 1-1/2 in. Includes 675 self-tapping screws. Includes depth collar and hex key. From the Manufacturer This durable hardened steel driver bit is designed for exclusive use with the Kreg Deck Jig. It features a quick-change compatible shank and a magnetic tip. This durable hardened steel driver bit is designed for exclusive use with the Kreg Deck Jig. It features a quick-change compatible shank and a magnetic tip. Depth collar and allen wrench included. Included Depth Collar and Allen Wrench.